Founding members Joe Howes (lead guitar) and Mackenzie Walas (lead vocals) met at an open mic night at a local tavern in Canada’s northern oil patch of Fort McMurray, Alberta in early 2013. Playing music was an outlet to get away from the busy lifestyle of a thriving boom-town. After playing songs together until they closed the place, it was certain that this was the start of a great musical friendship. Mackenzie had been performing around town and was looking to start a band. Joe had recently moved to town and had yet to meet anyone who shared his passion for rock music and performing. They were dedicated to forming a band that wrote great songs and could match that quality on stage. Their song writing process reflects the personality of the band. Laid back with a sense of motivated purpose for finding something new yet familiar, while trying not be limited by the influences of other genres…and having a whole lot of fun while doing it. Powerful raspy vocals with multiple harmonies, big guitar solos and heavy drums are the tools they use to find their sound. Bands like the Foo Fighters, Kings of Leon, Big Wreck, but also Stevie Ray Vaughn, ZZ Top, and the Eagles can be heard as influences. At the very same open mic night, a few months later, they met Handsome Rob (drums) and with the help of some friends, the band released its self-titled debut, a 6-song EP in February of 2014. After recruiting Jeremy Connell (bass), the band’s line-up was complete. Since then, they have been pouring the pavement, performing at a variety of events in the Wood Buffalo region and across Alberta. The band has had the privilege of sharing the stage with The Sheepdogs, The Trews, and Trooper to name a few. In November 2014, they began recording their new album at Sound Extractor Studios in Edmonton, AB. They wanted to capture the excitement and energy of their live shows, so most tracks were recorded live to retain their on-stage chemistry. “Kicking’ Stones” was released as the band’s first single and they filmed their first music video in support during the summer of 2015. The new album titled “The Devil’s in the Details” was released on September 26th, 2015. They plan on touring Canada in support of their record in the spring of 2016. 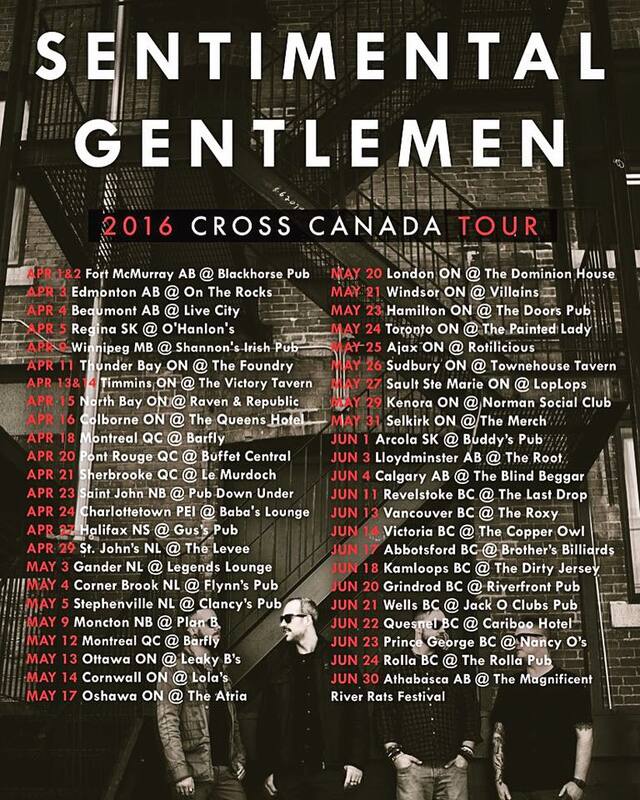 In the meantime, the Gentlemen continue playing a bunch of shows for awesome people, and writing new tunes for a future album as they plan for their upcoming Cross Canada Tour.